“March Magic,” the Special Olympics Kentucky State Basketball Tournament, returns to MidAmerica Sports Center in Louisville March 8-10. Teams qualify for the State Tournament through a series of Regional Tournaments that are held throughout February in Bowling Green, Florence and Elizabethtown. Teams will compete in multiple divisions at the Tournament. Games will get underway at 9 am on Saturday, March 9, on four courts and run until about 3 pm. Teams return on Sunday, March 10, again at 9 am, with all state championship games held that day. The latest games on Sunday should begin at 1 pm. In addition to the teams competing in the State Tournament, teams that do not qualify for the tournament have the opportunity to participate in the Team Skills Competition on Saturday. The Team Skills Competition measures teams’ abilities in six basic basketball skills and gives teams that did not reach the State Tournament the opportunity to participate in State Tournament weekend festivities. Those weekend festivities include a Healthy Athletes opportunity at MidAmerica on Saturday, and the victory dance on Saturday night. 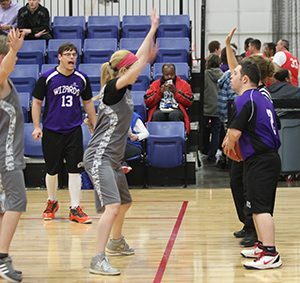 Not surprisingly, Basketball is the largest team sports offering on the Special Olympics Kentucky calendar with nearly 100 teams competing throughout the state each year. The Special Olympics Kentucky State Basketball Tournament is sponsored by Year-Round Partners Texas Roadhouse and Toyota Motor Corporation, as well as event sponsors Delta Dental, The Kentucky Wireless Association, Bachman Subaru and Subaru of America, Kosair Charities, the Kentucky Law Enforcement Torch Run and the Kentuckiana Basketball Officials Association. Members of the KBOA volunteer their time to officiate tournament games. For more information about the State Basketball Tournament or about the Special Olympics Kentucky basketball program, contact Director of Sports and Competition Hunter Brislin at 502-695-8222 or hbrislin@soky.org.